Scouting in Greater London is about Scouting in the official region of Greater London. It is largely represented by the Scout Association of the United Kingdom and some Groups of traditional Scouting including the Baden-Powell Scouts' Association. The Scout Association has recently defined Greater London as a Scout Region with a Regional Commissioner. There is a single member of the national Student Scout and Guide Organisation (SSAGO) covering all the universities in Greater London. As the capital city of the United Kingdom, London has played a key role in the development of Scouting. In 1909 some troops broke away from Baden-Powell's official Boys Scouts to form the British Boy Scouts. Sir Francis Vane was the leader and previously Baden-Powell's Commissioner for London..
One of the oldest Scout Groups in London is the 1st City of London Scout Group, which is still notable as the only Scout Group in the traditional City of London. The 1st World Scout Jamboree was held at Olympia, London in the summer of 1920. Here Baden-Powell was designated as Chief Scout of the World. The service performed by Scouts during war and particularly during air raids and the Blitz on London in World War II is recognised by their presence every year on Remembrance Day at the Cenotaph in London. A small museum of the story of Robert Baden-Powell is housed at Baden-Powell House in London. London Scouts celebrated the centenary of Scouting on 1 Aug 2007 in many ways, including the New Year's Day Parade in which many Explorer Scouts were led by the Enfield District Scout Band, LIVE 07, Festival of Scouting, and a Sunrise Ceremony at the London Eye. The first UK international camp of the new Scouting century was Campdowne 2008 in July 2008, where nearly 2000 participants from the UK and 23 other countries camped at Downe Scout Activity Centre. John May from London become the first UK Scout elected to the World Scout Committee since 1994 at the 38th World Scout Conference in Korea on 16 July 2008. 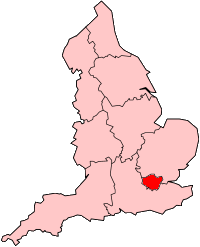 The Scout Association in Greater London is administered through 6 Scout Counties. Greater London Middlesex West Scout County is a Scout County of the Scout Association in the United Kingdom, covering an area stretching from the City of Westminster in the east to Stanmore in the north, Feltham in the south and Uxbridge in the west. 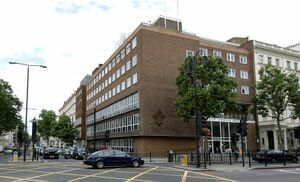 It serves the London Boroughs of Brent, Ealing, Harrow, Hammersmith and Fulham, Hillingdon, Hounslow, Kensington and Chelsea, and City of Westminster. The 2006 Scout census showed that the county has 5029 members. The County is divided into six districts, with over 5,000 Scouts in a combined total of 106 Scout groups. The band is also available to play at fetes, carnivals and other parades. In recent years the band took part in the 2002, 2007, and 2008 Lord Mayor's Shows, a Royal Visit to Enfield by Her Majesty Queen Elizabeth II and the Duke of Edinburgh in 2003. In 2007's Centenary of Scouting, the band took part in the London New Year's Day Parade, and played at the 21st World Scout Jamboree. In November the band formed part of the Promise Centenary Scout Band at the Lord Mayor's Show, and also played at the Scouting's Live '07 show at the The O2 in Greenwich, London. Greater London North East Scout County is a Scout County of the Scout Association in the United Kingdom, to the northeast of London and covers the London boroughs of Barking and Dagenham, Hackney, Havering, Newham, Redbridge, Tower Hamlets and Waltham Forest. The County currently has over 7,000 members in 139 Scout Groups, supported by a County Leadership Group, consisting of the County Commissioner, the four Deputy County Commissioners, the County Chairman and a Young Person Representative. This Group meets every two months to review the growth and development of Scouting in Greater London North East. Greater London South Scout County is a Scout County of the Scout Association in the United Kingdom, covering the London Boroughs of Wandsworth, Lambeth, Southwark, Lewisham and Greenwich, an area stretching from the South Bank in the north to Woolwich in the east, Putney in the west, to Crystal Palace in the south. Albany District has eighteen Scout Groups, four Explorer Scout Units and Network Albany. Lewisham North has seven Scout Groups and the Raven Scout Network. Greater London South East Scout County is a Scout County of the Scout Association in the United Kingdom, covering the London Boroughs of Bexley and Bromley, an area stretching from the Orpington in the southeast to Bexleyheath in the north. Greater London South West Scout County is a Scout County of the Scout Association in the United Kingdom, covering an area stretching from Sanderstead in the South East to Hampton and Whitton in the North West. Three of the four Scout Association Activity Centres are in Greater London. Baden-Powell House is a hostel and conference centre in central London. Gilwell Park is a camp site and activity centre, as well as a training and conference centre for Scout Leaders. It is close to Chingford, London. 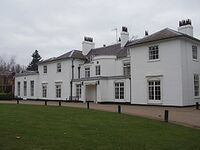 The White House at Gilwell Park has been the headquarters of The Scout Association since 2001, although Baden-Powell House (the former headquarters) still facilitates some departments of the Scout Association. Downe Scout Activity Centre is in Kent, but was owned by the Greater London South East Scouts from 1987 to 2005, when the site became under the direct control of The Scout Association. The Greater London Middlesex West Scout Association County is responsible for the Chalfont Heights camp site 30 minutes from London in Buckinghamshire. Originally purchased in 1938, it was operated by Scout Headquarters until 1970 when it taken over by the Greater London Middlesex West County as its County campsite and Training Centre. Danemead Scout Campsite, Scout Park, Bounds Green (Haringey District Scouts) and Frith Grange are associated with the Greater London North Scout Association County. The County is also responsible for Enfield Scout Sailing Association (ESSA). The Training ship RRS Discovery, Captain Scott's Antarctic expedition vessel, moored on the Embankment near the Temple was used by the Scouts between 1937 and 1979, when it was handed over to Maritime Trust and relocated in Dundee. The Docklands Scout Project was then created. The Project is on the Isle of Dogs, in East London, east of the financial City of London and opposite Greenwich across the River Thames. The Greater London North East Scout Association County also owns (through its Districts) the following Scout Activity Centres: Crow Camp, Fairmead Scout Campsite (East London District), Hargreaves Scout Campsite (Ilford East District), and the Michael Mallinson Centre ( Waltham Forest South District). Greater London South Scout Association County owns the South London Scout Centre, the closest camping centre to central London at Dulwich. The District campsite is Hammerwood campsite, located in East Grinstead. It is 27 acres of woodland plus a field. The forest is mostly unpartitioned and this makes it a favourite for survival training weekends and reenactment/live action role player games. Lewisham Manor Scout District is responsible for Frylands Wood Scout Campsite. Wilberforce Scout Centre is owned by Bromley Scout District of the Greater London South East Scout Association County. Yr Hen Neuadd ('The Old Hall'), Bethesda, Gwynedd, North Wales, originally a Salvation Army Hall, was converted in 1970 by the Greater London South West Scout Association County as an Activity Centre. Polyapes Campsite lies just outside the county boundaries but is managed jointly between Royal Kingston and Esher Districts.It has been in continuous use since 1929. There were 36 Scouts from Greater London North taking part in the 21st World Scout Jamboree in August 2007. The Enfield District Scout Band played at the Closing Ceremony. The Greater London North East Scout County sent forty-five Scouts to the 21st World Scout Jamboree. Thirty six, plus four leaders, acted as a whole contingent while the remaining nine were part of another contingent with Guides from Cambridge and a Scout troop from Montserrat. Two contingents from the Greater London South East Scout County attended. Greater London South West (GLSW) had two full contingents (of 36 Scouts plus 4 leaders each) named Victory Unit and Nelson Unit. GLSW Additionally provided a patrol (9 Scouts) and the overall unit leader in the most diverse unit at the jamboree, consisting of 25% GLSW Scouts, 25% Scouts from Fife in Scotland, 25% Guides from Somerset and 25% Scouts from Mauritania in North Africa. This unit was named The Discovery Unit. Two of the unit were present at the Sunrise Ceremony on Brownsea Island to welcome the 2nd century of Scouting at the movement's birth place. Sutton District's and Kingston District's Scout Bands (both part of GLSW) played at the closing ceremony. Albany District Gang Show in Greater London South. Scout House, 252 Jamaica Road, Bermondsey. SOUWEST Gang Show. Greater London South West Scout County. Secombe Theatre in Sutton. ShowStoppers Gang Show. Greater London North East Scouts Gang Show. Started 2003. Erith and Crayford "CAPERS" Gangshow. Held at Erith School annually. "Enfield District Scout Band's website"
This page was last edited on 6 May 2012, at 20:06.